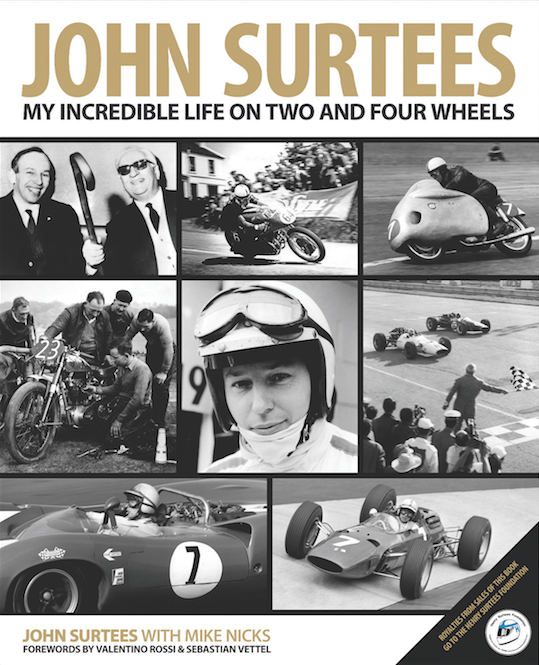 Scandalously unfamous, John is the only man to ever win a world title on two and four wheels. Not many men can count themselves as Valentino Rossi’s idol, but this one can. 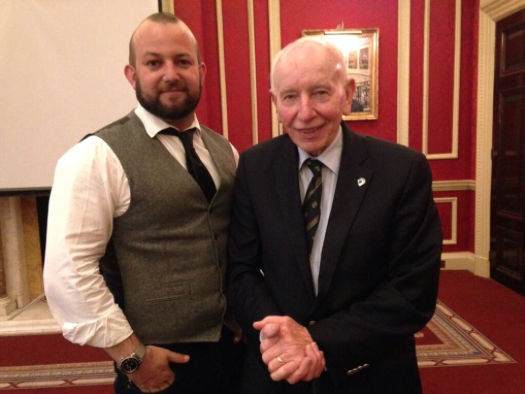 I caught up with John at the launch of his book at the RAC club in London. After listening to him recount tales of mischief spanning decades, I grabbed the chance to sit down and catch up a man that if I was in the market for an adopted grandpa, would top the list. The smile in my face below is the smile I pull when I forget to be a professional journalist and revert back to starry eyed fanboy. You can read the full interview below. Always meet your heroes. Always. SB: John, how did you go form being a teenager in Tatsfield to a multiple world champion on bikes as well as in cars? I was serving my apprenticeship at Vincent in the early 1950’s, I spent all of my spare time racing motorcycles in the UK. When my fathers’ dealership in South London started selling NSU’s as well, I ended up getting the opportunity to enter my first Grand Prix on one, it was in Ulster. BMW then came along and asked me to ride their bike at the Nordschleife and at the end of the season, Count Agusta called and asked me to go and ride MVs for him in the world championships. At the time I wanted to ride a Norton, I’d pitched a plan of how I could win a world title for them, it involved fitting streamlined bodywork and carrying out more tuning. They listened, agreed with everything I said and then said no. They said that they wouldn’t do it as there was a chance I’d earn more money than the director of Norton. Perhaps that thinking was part of the reason that the British motorcycle industry died. I went out to meet MV Agusta, tested the bike and thought it was great, I loved the noise. It seemed a bit puddingy and not very positive, but I thought I could solve that. I sat with the Count to do the deal, it was very daunting but I loved it, especially the Vino. They were very impressed with my test on their bike and I met at his office to sign a contract. Just before I signed, he motioned for me to stop and said there was one final test I had to pass. He lefty the room and came back in with an elderly lady. She had a veil covering her face but I could see her studying me for a few minutes. She then whispered something to the Count and with a smile he announced that I’d been accepted into the family, it was his mother, she insisted on giving any new rider the once over before they could ride for MV. The Italians definitely did things differently but that introduction helped me understand how Enzo Ferrari’s mind worked later on in my career when I began to work with him. 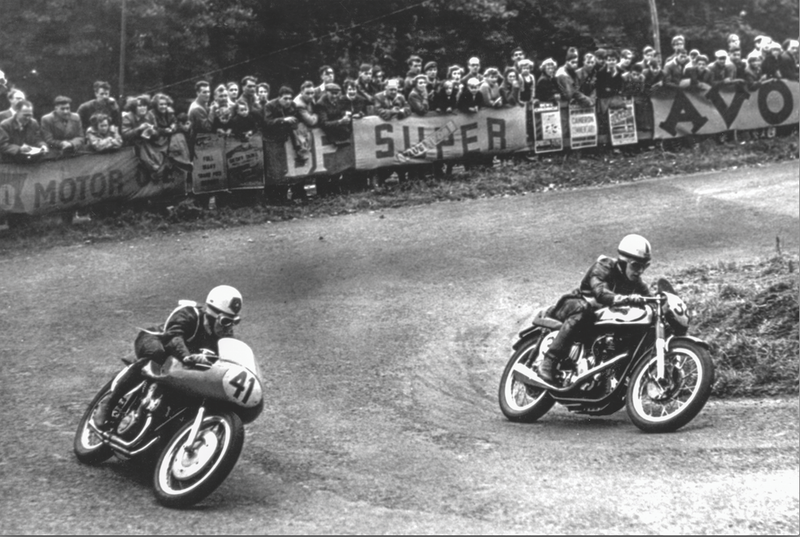 In 1960, I won the 350 and 500 world championships for MV. At home I was building an experimental Norton to contest races at local tracks in the UK when I wasn’t racing in the world championship series. I liked to race on my own machines in the UK as it allowed me to pick up the spanners. The Italian press had written a piece about ‘Surtees not needing an Agusta to win’ and Count Agusta didn’t like it. He banned me from racing on anything other than MV’s in anything other than the world championship. Suddenly my race calendar shrank from 85 possible races a year to just 14 rounds of the world championship. By coincidence I had lunch with Reg Parnell who was running the Aston Martin race team at the time. He was running Stirling Moss and when he called to ask me to test the DB1R at Goodwood I thought it’d be a nice day out. I went down and drove round and round. When I came in he asked me to sign a contract immediately, I declined and maintained my stance as a motorcycle racer. I tested again the next day and that evening, Stirling Moss called me at home. He said that he’d heard I’d been driving his cars, he asked how I was getting on. We discussed a corner called Fordwater, one which I’d been struggling on. He told me it was “Harry Flatters”, meaning flat out all the way through. The next day I built up to a good speed and hit Fordwater flat out like Stirling said he did. When the car stopped spinning in a field next to the track, a member of the team asked me what I was doing. I said I was trying to match Stirling through the corner in the hope of matching his lap time. It turned out that I’d already been quicker than him on previous laps, it also transpired that Stirling Moss had never been through Fordwater flat out. I’d learned my first lesson in Formula One. Car racing replaced the non-championship bike racing I wasn’t allowed to compete in if I was to ride for MV Agusta and my career on four wheels began. SB: John, you’re one of very few living world champions to win without getting your knee down, why is that? We never used to get our knee down when I was racing. I think it’s fairly well accepted that I possibly started the trend of shifting weight off the middle of a bike. Tyre development really started in the late 60’s, the sizes didn’t really change, but as the compounds improved so did feel and it was possible to carry a bit of drift on these tyres. The problem for me was that my engine was very wide and I started grinding bits off the bike of in corners when I leant it over. I was forced to adapt my technique, so I started shifting my bottom to move my bodyweight to the inside of the bike. We never stuck our knees out though. A rider has to be able to relate to a machine. My style was of the time and Marquez’ style is of the time as well. His style has been built around the kind of bikes he rides, the programme he rides to interprets everything he feels. I’ve heard that when his bike starts moving around and sliding, he has to wind the throttle on and the computer takes over! That would be totally different to my style. 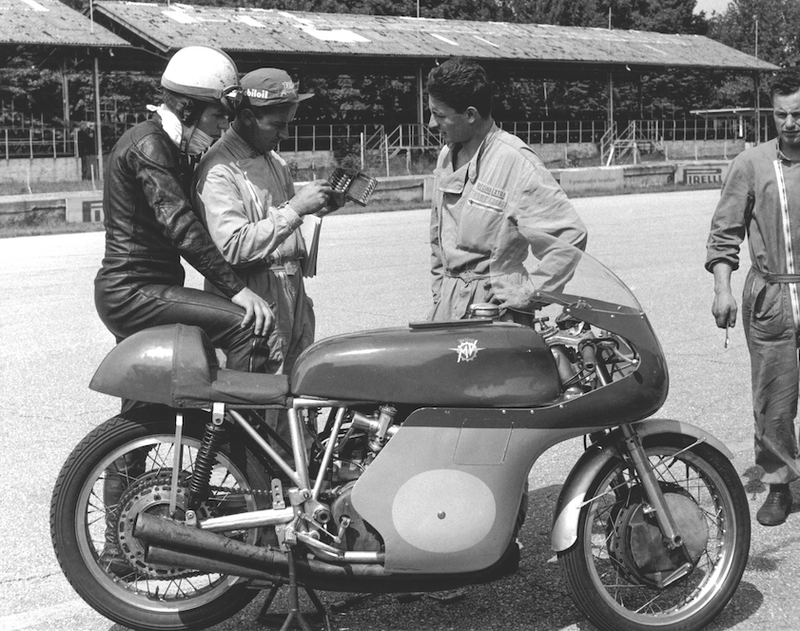 SB: What if we offered you the chance to go back to 1953 to relive your entire career again with all the same success, or you could be 22 in 2014 and have your time again in today’s modern MotoGP era, which would you go for? I’m a competitor aren’t I, I live to compete and so, I couldn’t refuse that challenge to race on a new machine against new riders. The fact remains that if I were 22 in this era, I’d have grown up using computers all the time like this generation and I’d be used to riding these bikes like the current crop are. SB: You’ve won on short and long circuits in cars and bikes, where do your senior wins at the TT sit in terms of difficulty? There used to be two distinct style of racing when I first started. 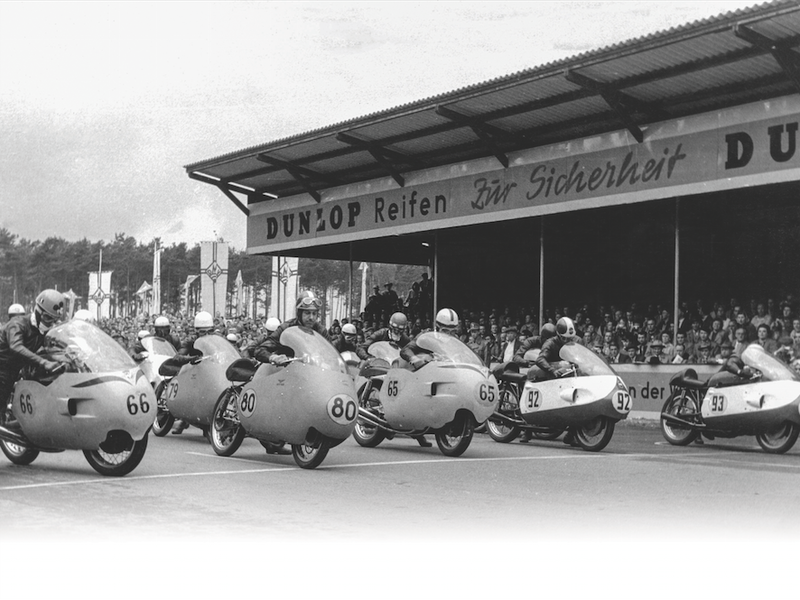 Grand Prix riding and short circuit racing, they were very different. GP riding had to be supremely precise, accurate lap after lap and, dare I say it, courteous when needs be. The limitations of the tyres and everything else mattered. Short circuit racing was all about whistling up the inside of people when they least expected it, taking chances to get past somebody that you just wouldn’t do in longer grand prix races. The Isle of Man is all about rhythm. It’s obviously important to learn your way around and know what was where. It was important to know where you could use the curbs if you got too much steam on and the bike stepped out of line. The moment I used to bump a bike and head off down Bray hill, I tried to get into a rhythm as soon as I could, often my fastest lap of the race would be my first lap of the race, that’s when I could gap the other competitors. But, that didn’t mean that we didn’t used to push, we absolutely used to push but there was no point trying to scratch through one corner too fast because it meant that you’d foul yourself up for the next section. Linking those sections is the key to going well out there. Winning at the TT was always special to me, but at the time, I just wanted to win everywhere. SB: What single feature has given motorcycle racing the biggest leap forward in terms of reducing lap times and increasing performance in your lifetime? I don’t think it can be attributed to any one thing in particular. The overall package has improved because of minor improvements in every area. With more power comes the need for better brakes. Modern racers have a lot more rubber on the road and a lot more braking power, that means that the front and the back of the bike need to be tied together so much better than they used to. That brings improvements in suspension, which in turn allows ridiculous braking distances compared to when I used to race. Of course as bikes got quicker, the circuits had to adapt to slow bikes down. If you look at streamlined bikes of my era, they were almost as fast as they are now. The Moto Guzzi V8 was good for 190mph at Spa, but of course it took time to get up to that speed. That bike probably did no more than 80 horsepower. All I can say is we used to ride them at the maximum we could at the time, all the time. Buy this book, it is a beauty.